Offer an awesome product or service. Scream from the rooftops that everyone should buy it. Get lots of customers. Make lots of money. In an ideal business world, marketing would be that easy. But it’s not. Modern consumers are smart, educated and demand authenticity. Buyers today know how to block out even the most clever marketing and advertising materials. As consumers ourselves, Stratus can relate. But lucky for you, we’ve figured out the secret sauce to reaching your ideal buyers-the people who benefit the most from what you’re offering. We reach your ideal buyers through the integrated approach of inbound marketing, and Stratus can customize an inbound marketing strategy that’s right for you. 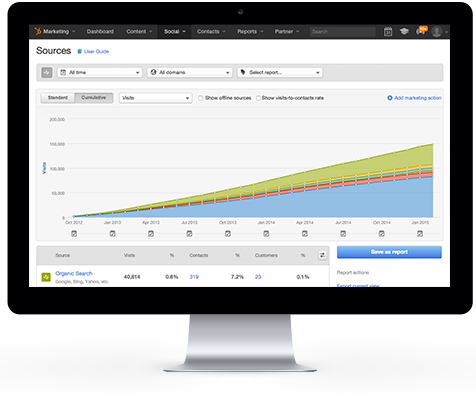 Inbound marketing is a core component of our successful closed-loop marketing approach. It enables authentic interaction with your audience, that authenticity breeds trust, and that trust creates solid, long-term client and customer relationships. It’s the stuff dreams are made of and by dreams, we mean repeatable ROI. Get a glimpse inside the inbound methodology and learn how to create a winning inbound marketing strategy. Stratus Interactive is an award-winning, full service inbound marketing agency and web designer—and one of only 24 worldwide HubSpot Platinum Partners. We create remarkable content and user experience focused designs to authentically generate leads and get more customers for our clients. Oh, and we’re numbers nerds- we use the power of analytics to build marketing campaigns and websites that deliver repeatable ROI. Our team will build a stronger foundation for your business through HubSpot’s tried, trusted and proven inbound marketing methodology—helping you attract new prospects, convert those prospects into leads, close those leads into customers, and delight those customers so they stick around for the long haul (and give you repeat business!). We love inbound marketing because it really, truly works. We love HubSpot because they are passionate and invested in making the most user-friendly and effective inbound marketing tools in the entire world. And we absolutely can’t get enough of using inbound and HubSpot to make our clients as happy, successful and profitable as possible. Let us customize a measurable inbound marketing plan for you- we’d be delighted to learn more about your unique business goals and how we can help you achieve them! Ready for an Inbound Intervention?